Fulham occupy possibly one of the most picturesque locations for a football ground, it sits alongside the River Thames and this fact very nearly proved its downfall in 1987 when it was primed to be sold for property development, luckily though the plans were shelved and it remained a football ground. Craven Cottage has been Fulhams home ground since 1896, they were though forced to move out and ground share with QPR at Loftus Road for 2 years while Craven Cottage was brought up to Premiership standards, they returned home in 2004. 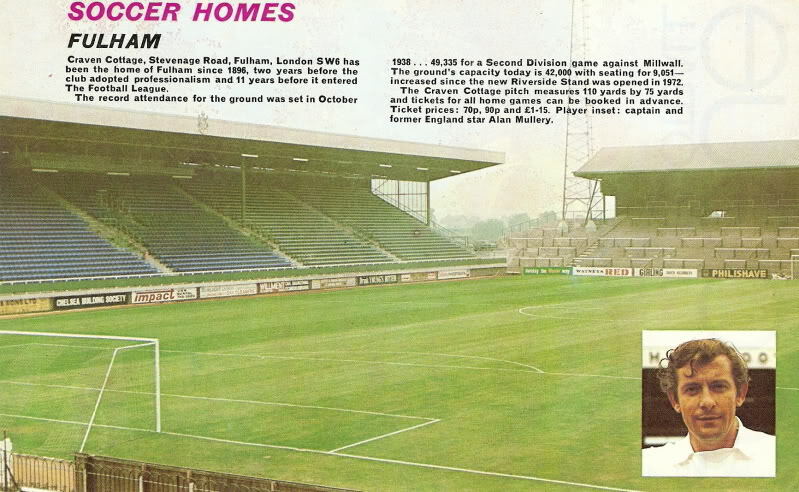 The picture below from a 1970's Football Review magazine shows the ground as it used to look. "Craven Cottage, Stevenage Road, Fulham, London SW6 has been the home of Fulham since 1896, two years before the club adopted professionalism and 11 years before it entered The Football League. The record attendance for the ground was set in October 1938...49,335 for a second division game against Millwall. The grounds capacity today is 42,000 with seating for 9,051, increased since the new Riverside Stand was opened in 1972. The Craven Cottage pitch measures 110 yards by 75 yards and tickets for all home games can be booked in advance. Ticket prices: 70p, 90p and £1.15. Player inset: Captain and former England star Alan Mullery." I have also found an absolutely stunning piece of old film footage on Google that shows the old Craven Cottage ground as it used to be in the 1970s.